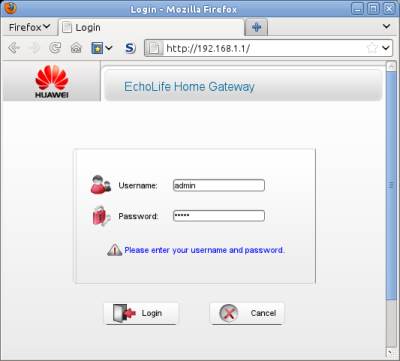 This article is about unlocking the BT Openreach VDSL2 FTTC Huaweri Echolife HG612 modem/router. Important note to acknowledge the original author. The author of said article is attributed to Asbokid who created it under the Creative Commons Licence which could originally be viewed from his blog HG612 Hacking, a copy of the original which is mirrored here in pdf form. Asbokid is acknowledged to be the author of said article and the community would like to thank him for his hard work and dedication put into unlocking the HG612. It is sad that the original site is no longer live as many have benefited from his time and efforts put into making this information available. The article below replicates his instructions to provide a live and working copy of his work and is published under the same NonCommercial attribution as the original. The HG612 is shipped in a crippled state with no user interface. However the device can be unlocked. Once unlocked, web access is available. 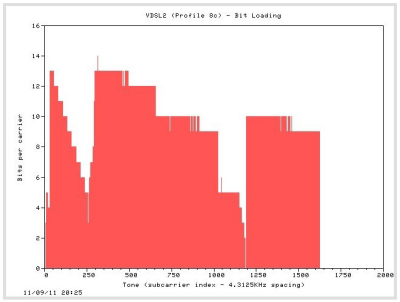 The web interface provides technical information including xDSL line statistics. shell access through telnet and ssh, and more. To unlock the modem follow these instructions carefully. 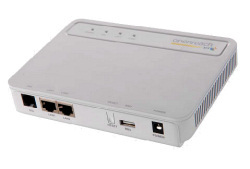 Configure the ethernet NIC of your PC with IP address 192.168.1.100. Press the RESET button on the modem and keep it pressed. Do not release the button yet. Keep the RESET button pressed for a further five seconds. Select unlocked firmware from your hard drive and click Update Software. has rebooted. This may take several minutes. 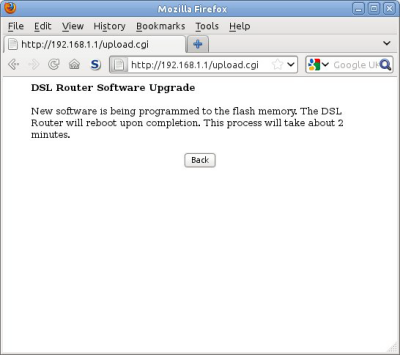 Once the modem has rebooted, visit the address http://192.168.1.1/ again. Enter the username 'admin' and password 'admin'. 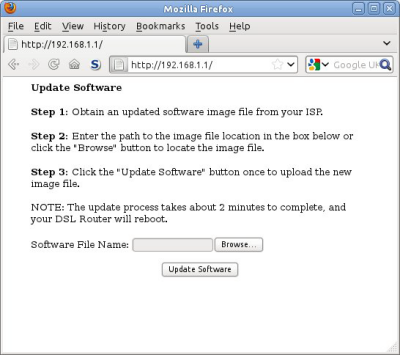 The opening of a telnet session is shown in Fig. 6. 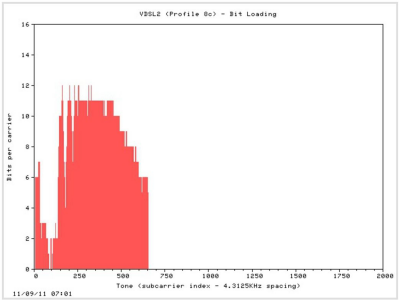 VDSL2 Profile 8c normally utilises two downstream frequency bands, D1 and D2. The second band (D2) runs from 5.1MHz – 7.0MHz and provides subcarrier tones 1192-1627. Fig.9 reveals that Band D2 is not being utilised at all. This will result in downstream throughput that is no better than ADSL2+. By contrast, the Bit Loading graph of Fig. 9 generated from a different line illustrates a good connection. All bands are in use and generally high bit depths are found across the spectrum of the band plan. 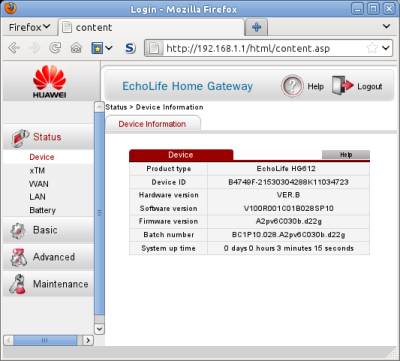 The scripts will run on Linux and Windows and are included with other 'hacking' tools in a Toolkit for the Huawei. 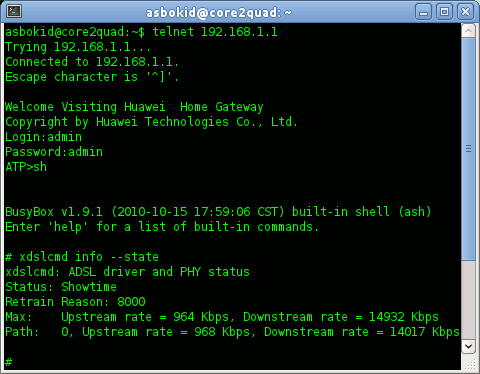 line statistics are available using the xdslcmd tool from telnet or ssh. Reboot the HG612 and allow it to stabilise. release it. This causes a 'Long Reset'. Give the modem time to reboot again after the 'Long Reset'. 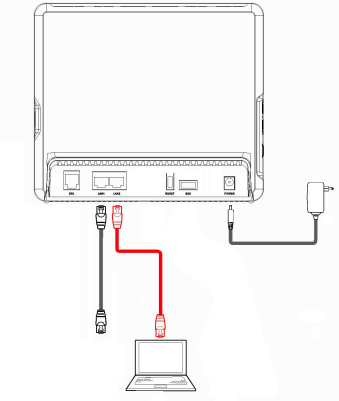 Connect your PC to the LAN2 socket on the Huawei. Burakkucat - for his many suggestions and improvements, never-ending testing, for applying his wizardry with Unix shell scripting to the graphing scripts. greatly improving these instructions, and for porting the graphing scripts to Microsoft Windows. <paul @ sbrk.co.uk> - for spotting and squishing a nasty mksquashfs bug. supplied feedback, screenshots and telnet session logs. .... and obviously Asbokid himself.